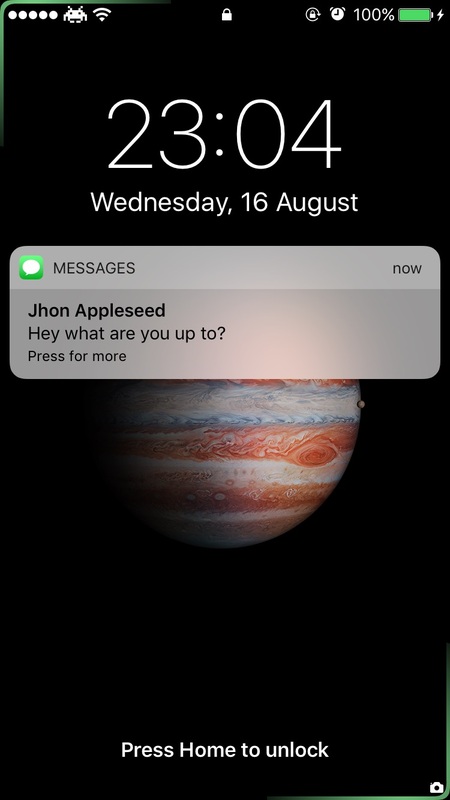 If you’re a fan of the way the notification system looks on Galaxy S8 devices, then you might want to pay attention to a new jailbreak tweak called Edgify by iOS developer NOPTeam. If the concept sounds familiar, that’s because a free tweak called 3Edgy5Me was just released last week that did the same thing. On the other hand, we’ll show you what sets them apart in this piece. All settings are applied on the fly, although you might have to disable and re-enable the tweak to jump-start things after installation. Otherwise, you might not see any changes. It may be a little difficult to see the against the stock wallpaper, but you should see chasing green lines along the sides of the GIF in the first image and strobing green lines along the sides of the GIF in the second image. For the most part, Edgify has a lot of the same options as the free alternative, 3Edgy5Me. I like Edgify a little bit more because the animations look sharper and because the rounded corners on the Lock screen are more aesthetically pleasing than the pointy ones you’re forced to see in 3Edgy5Me. Obviously, the effects of Edgify are purely cosmetic, so the tweak isn’t for everyone. Nevertheless, it’s a nifty addition to what otherwise feels like a barebones notification system on the iOS platform that doesn’t stand out from the competition. If you’re interested in trying Edgify, you can download the tweak from Cydia’s BigBoss repository for just $0.99. Edgify works on all jailbroken iPhones running iOS 10.1 or later. Are you a fan of these Galaxy S8 animation styles? Share why or why not in the comments section below!